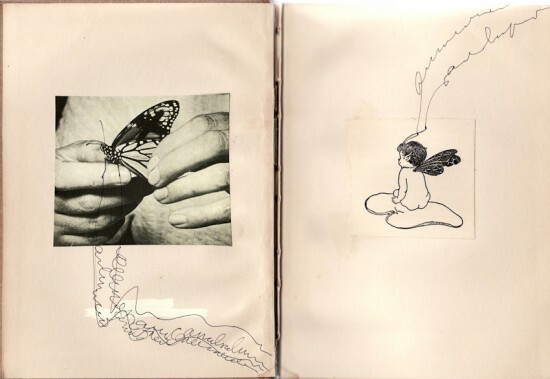 When Mary Ruefle’s book Melody: The Story of a Child arrived in the mail several weeks ago, I could smell the musty, antique pages and the faint whiff of stale cigarette smoke before I even opened the package. The beige envelope arrived by U.S. Postal Service, without insurance and without tracking–a method that is not only cheaper, but also less conspicuous, as Ruefle explained to me on the phone one afternoon. 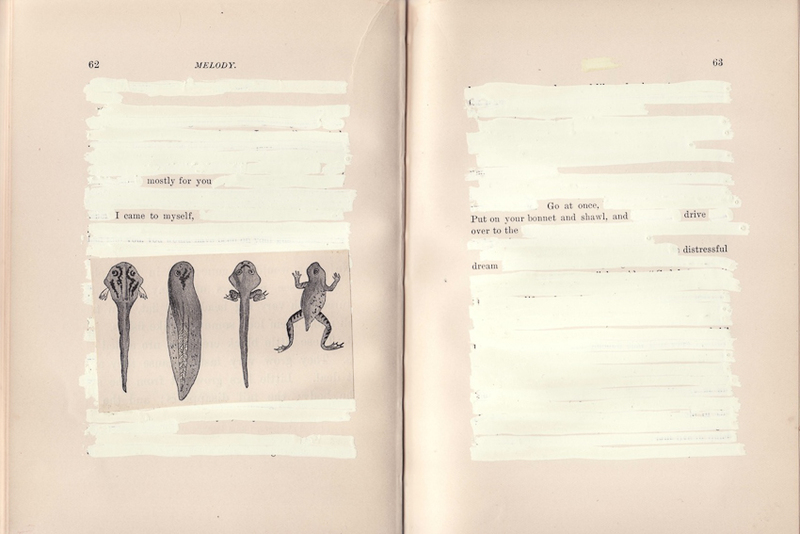 A new erasure by Mary Ruefle is a rare event, and the publication of one online or in print even rarer. 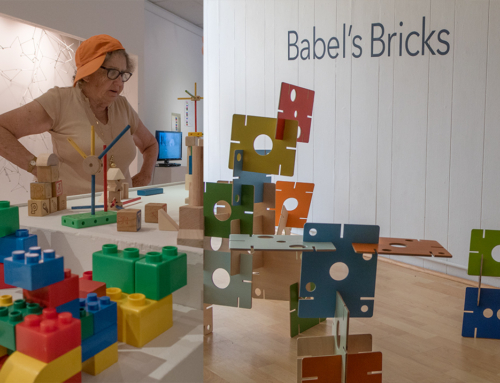 Her one-of-a-kind creations occasionally appear in journals or are purchased by museums or collectors. In 2006 Wave Books published the acclaimed volume A Little White Shadow, a book of “haiku-like minifables, sideways aphorisms, and hauntingly perplexing koans,” as described by Publisher’s Weekly. 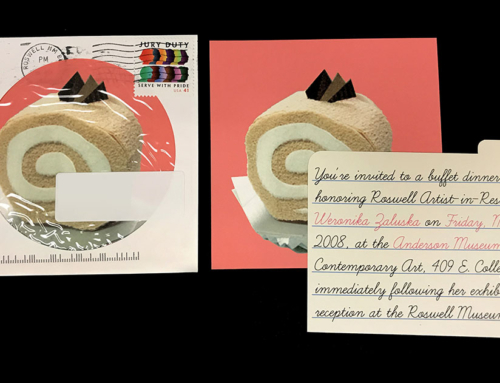 Although Ruefle doesn’t own a computer or do email, she has a website where fans can enjoy perusing a small sampling of her one-of-a-kind erasures. Still, these unique works are difficult to come by, so when Mary offered to share an erasure that had never been seen before, I jumped at the chance to publish it on Gwarlingo. "I have resisted formal poetry my whole life," says Mary Ruefle, "but at last found a form I can't resist. It is like writing with my eyes instead of my hands." 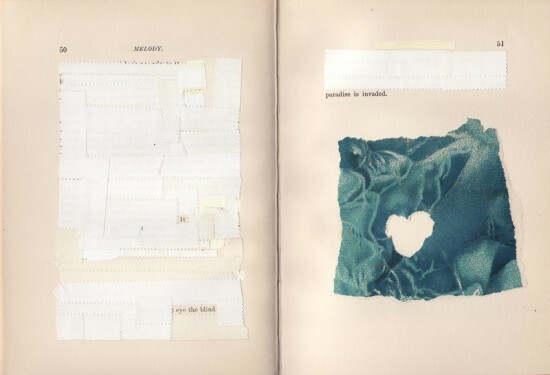 Ruefle is one of today’s most admired practitioners of erasure poetry–the creation of a new text by disappearing the old text that surrounds it. Gwarlingo readers who enjoyed the erasure poetry of Jen Bervin last December will find much to appreciate in Ruefle’s work. Her writing is playful, poignant, humorous, and eccentric, and like no other voice I know. It is fitting that Ruefle’s Sunday Poem should follow my article on Lewis Hyde and appropriation, for Melody is an excellent example of a creative work made from existing text, in this case, a 19th century novel called Melody: The Story of a Child. In Ruefle’s skillful hands, we enter an alternative world that is far removed from the original saccharine plot of Laura E. Richards’ 1894 melodrama: “Miraculously saved from charred rubble, blind twelve-year-old Melody changes the lives of an entire community as well as her greedy captors.” Ruefle has transformed Richards’ religious melodrama into a compelling, concise, subversive work of art. 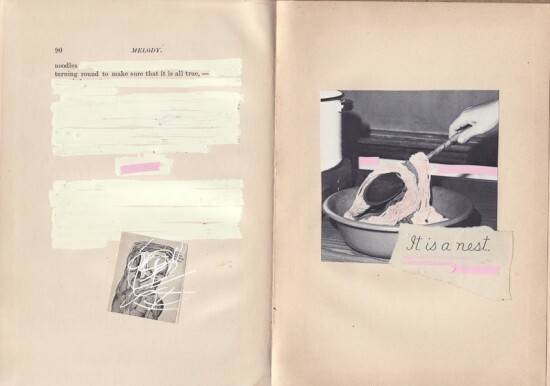 William Burroughs and Brion Gysin are both considered pioneers of the “cut up” technique, a method that involves cutting words from newspapers and magazines and rearranging them into new stories and poems. 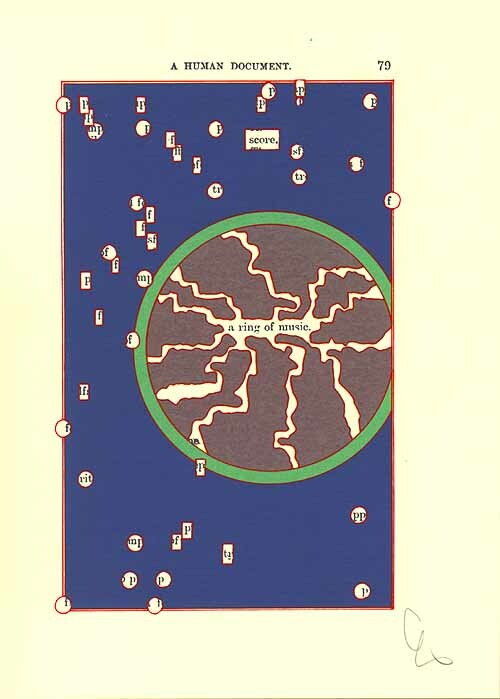 (Burroughs said he learned the technique from Gysin). 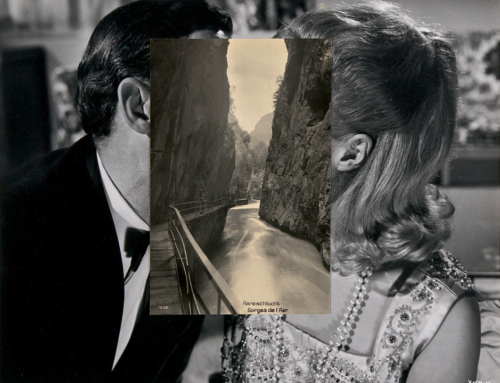 But text collage predates Burroughs and Gysin. At a Dadaist rally in the 1920s, Tristan Tzara offered to create a poem on the spot by pulling words at random from a hat. And in 1922 T.S. Eliot published The Waste Land, a touchstone of 20th century literature comprised partially of quotes from the Bible, Bram Stoker, Ovid, the Hindy Brihadaranyaka Upanishad, Shakespeare, Whitman, and other sources. But the technique can be traced back even further. 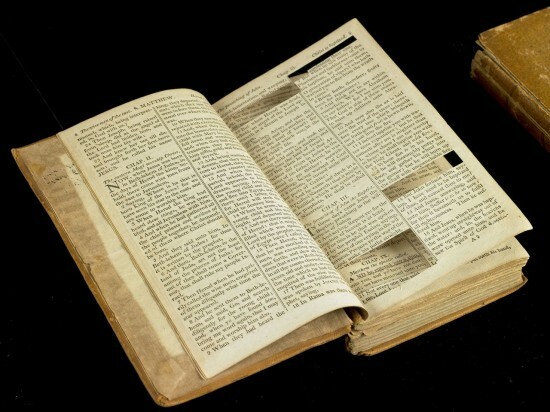 In 1819 Thomas Jefferson cut and pasted numerous sections from various Bibles as extractions of the doctrine of Jesus. Using a razor, he arranged selected verses from the books of Matthew, Mark, Luke, and John in chronological order, mingling excerpts from one text with those of another in order to create a single narrative. Jefferson’s new Bible, The Life and Morals of Jesus of Nazareth, excluded the supernatural elements of the New Testament, as well as perceived misinterpretations he believed had been added by the Four Evangelists. 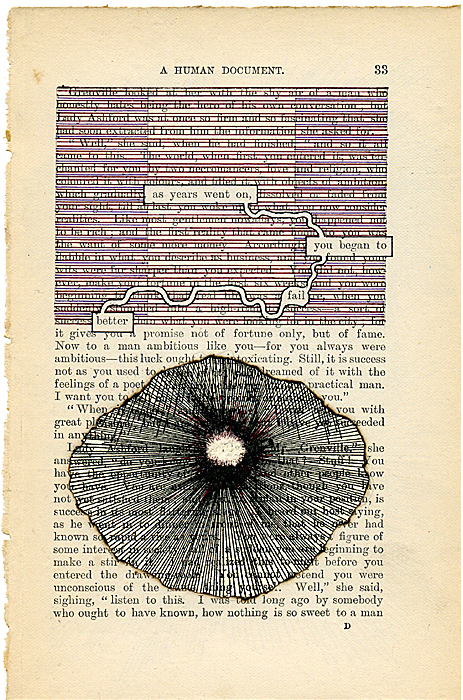 English artist Tom Phillips is another pivotal erasure artist. His best known work is A Humument: A Treated Victorian Novel, an erasure Phillips began creating in 1966 and continues to publish in new editions today. 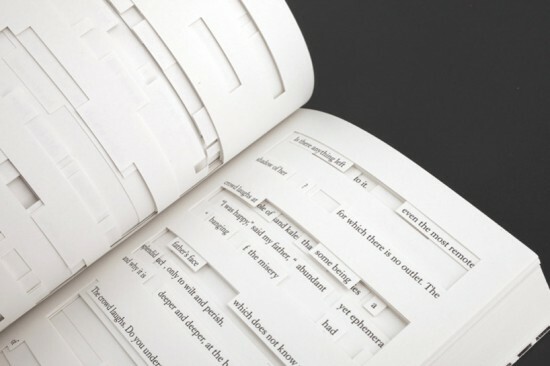 “It is a forgotten Victorian novel I found by chance,” Phillips explained, “plundered, mined, and undermined its text to make it yield the ghosts of other possible stories, scenes, poems.” A more recent addition to the erasure canon is Jonathan Safran Foer’s Tree of Codes, a sculptural piece of art and book created from Bruno Schulz’s book, The Street of Crocodiles. 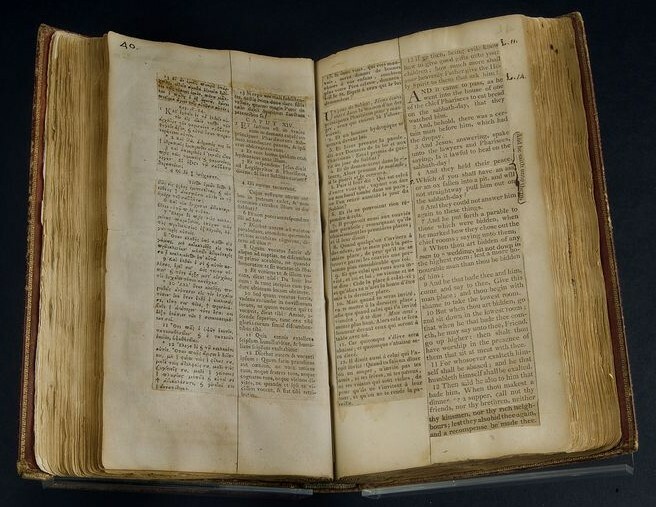 Jefferson's new Bible, "The Life and Morals of Jesus of Nazareth," excluded the supernatural elements of the New Testament, as well as perceived misinterpretations he believed had been added by the Four Evangelists. 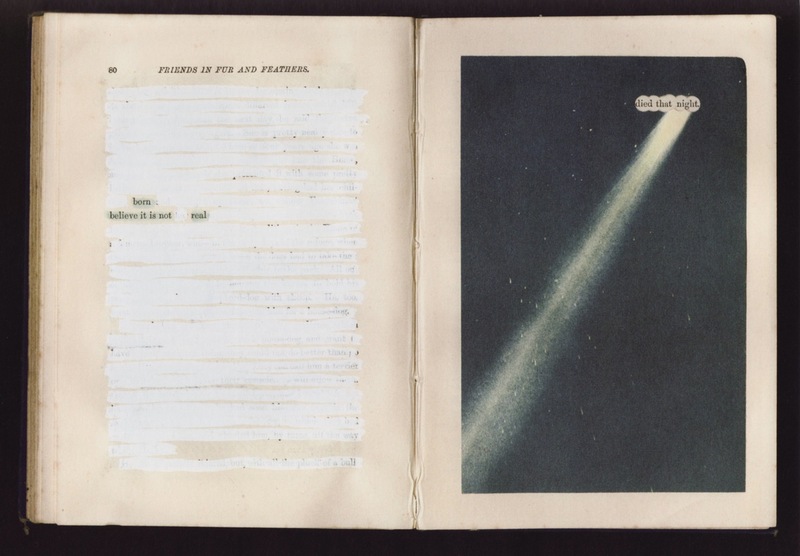 English artist Tom Phillips is another pivotal erasure artist. His best known work is "A Humument: A Treated Victorian Novel," an erasure Phillips began creating in 1966 and continues to publish in new editions today. 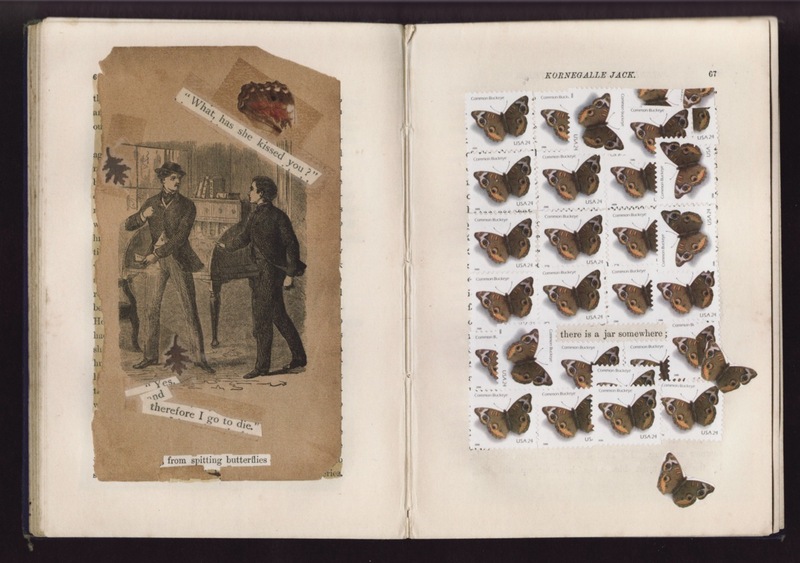 "It is a forgotten Victorian novel I found by chance," Phillips explained, "plundered, mined, and undermined its text to make it yield the ghosts of other possible stories, scenes, poems." 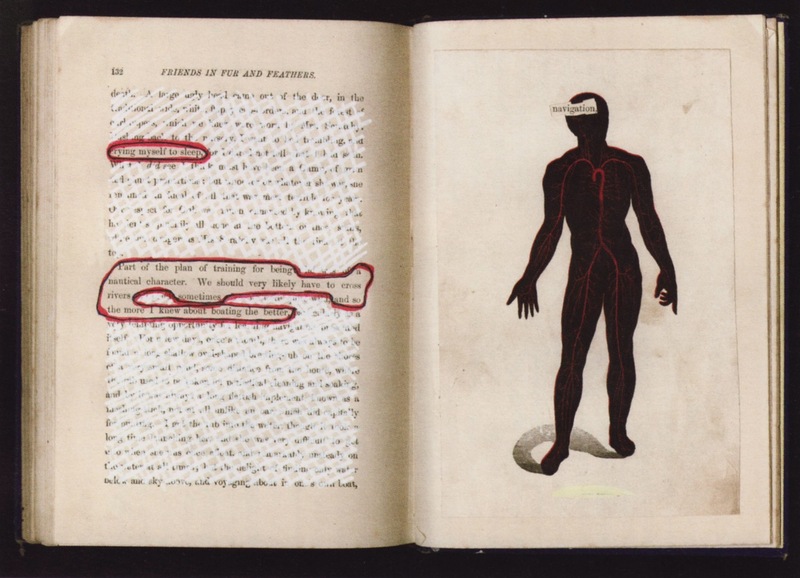 A more recent addition to the erasure canon is Jonathan Safran Foer's "Tree of Codes," a sculptural piece of art and book created from Bruno Schulz's book, "The Street of Crocodiles." It is in this tradition that Mary Ruefle’s captivating erasures belong. 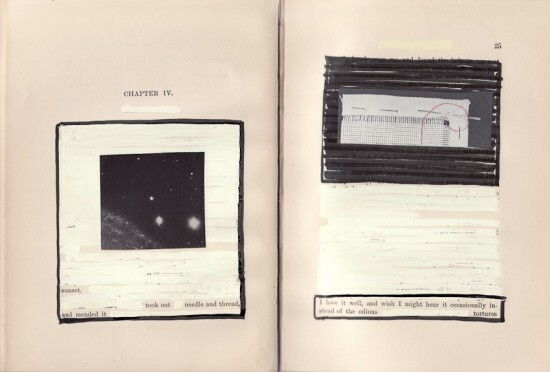 Not only is Ruefle following in the footsteps of Jefferson, Gysin, and Phillips, but she is one of the finest erasure artists working today–a brilliant artist who deserves more attention than she’s received. 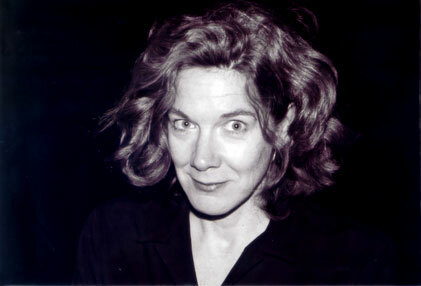 Although she has been awarded fellowships from the National Endowment for the Arts, The MacDowell Colony, and the Guggenheim Foundation, as well as a Whiting Writers’ Award, and an Award in Literature from the American Academy of Arts and Letters, she remains on the fringes of the contemporary canon. While this unplugged lifestyle may not help Ruefle promote her writing, I suspect it does help her create these unique, thoughtful works of art. This is “slow art” at it’s best. Reading Melody, I was struck by the amount of time (and patience) it takes create a one-of-a-kind work like this, and also by the passage of time itself–by the threads of human connection that allowed this slender volume to make its way to Ruefle, then to me, and now onto you. 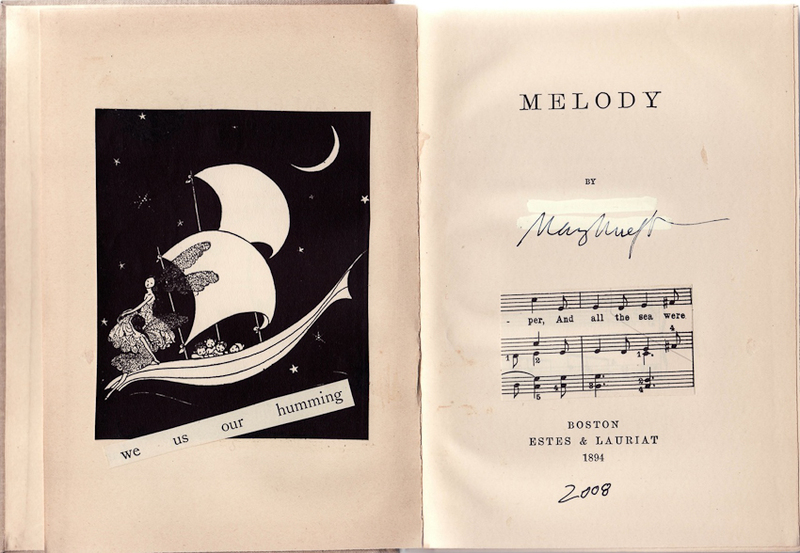 To flip through the pages of Melody is an intimate experience. The hand of the artist is in evidence on every page–in the smears of white-out, the fingerprint smudges, the playful, colorful swirls, the vexed, heavy black marks that transform text into a gaping void. The books have been called ‘found poems,’ but I don’t consider them as such. A found poem is a text found in the world, taken out of its worldly context and labeled a poem. 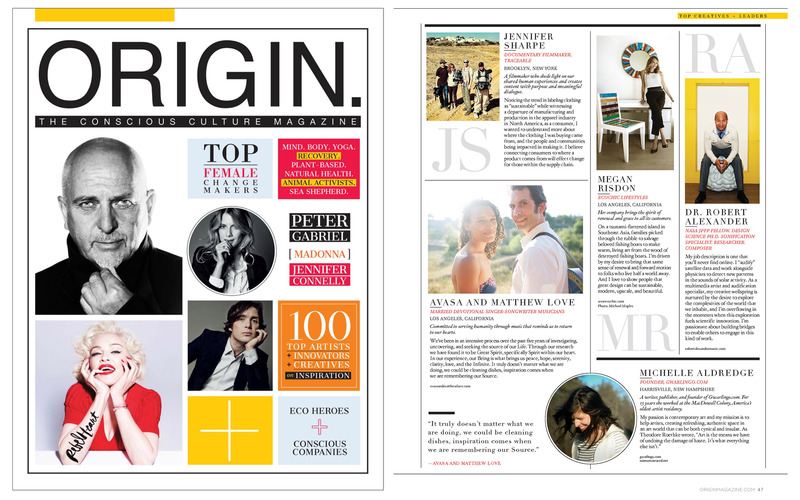 I certainly didn’t ‘find’ any of these pages, I made them in my head, just as I do my other work. In the erasures I can only choose words out of all the words on a given page, while writing regularly I can choose from all the words in existence. 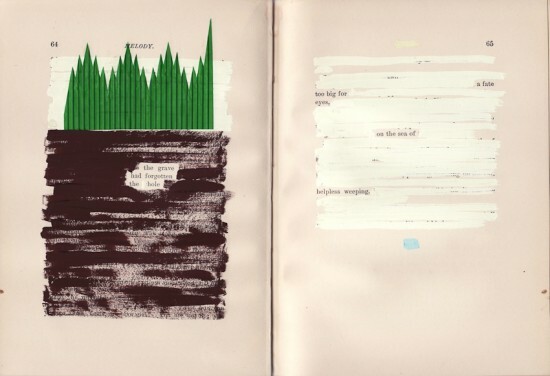 In that sense, the erasures are like a ‘form’–I am restricted by certain rules. I have resisted formal poetry my whole life, but at last found a form I can’t resist. It is like writing with my eyes instead of my hands. I use white-out, buff-out, blue-out, paper, ink pencil, gouache, carbon, and marker; sometimes I press postage stamps onto the page and pull them off–that literally takes the text right off the page! 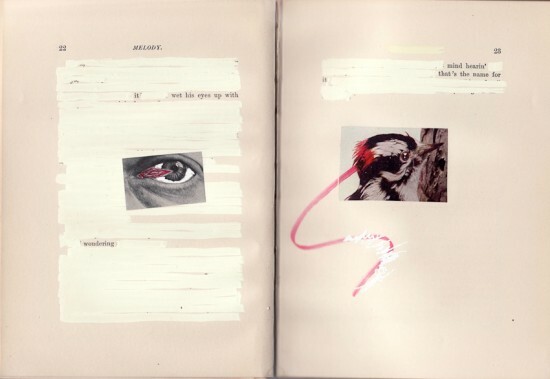 Once, while working on an all-white erasure, I had the sense I was somehow blinding the words–blindfolding the ones I whited-out, and those that were left had to become, I don’t know, extra-sensory or something. Then I thought no, I am bandaging the words, and the one left were those that seeped out. It is not the same to read this beautiful book on a screen. You’re missing the feel of the soft cloth cover and fragile, antique pages, as well as the musty smell of aging paper and stuffy cigarette smoke. You cannot feel the rough smear of white-out, touch the moth’s wings, or experience the jagged edges of repurposed postage stamp sheets. It is not the same, but it is nevertheless a rare opportunity to inhabit the unconventional world of Mary Ruefle—a place as visceral as anything you’ll encounter. 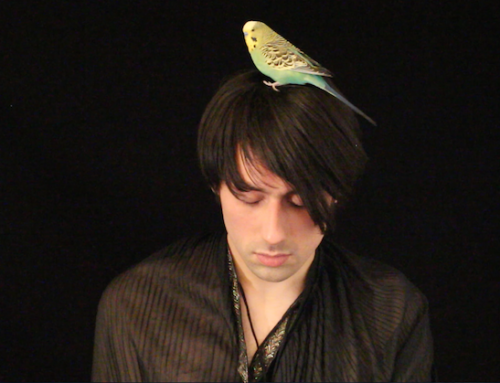 I have included a few sample pages of Melody here as a teaser for this special expanded edition of the Sunday Poem, but the work is best viewed full-screen and in sequence. 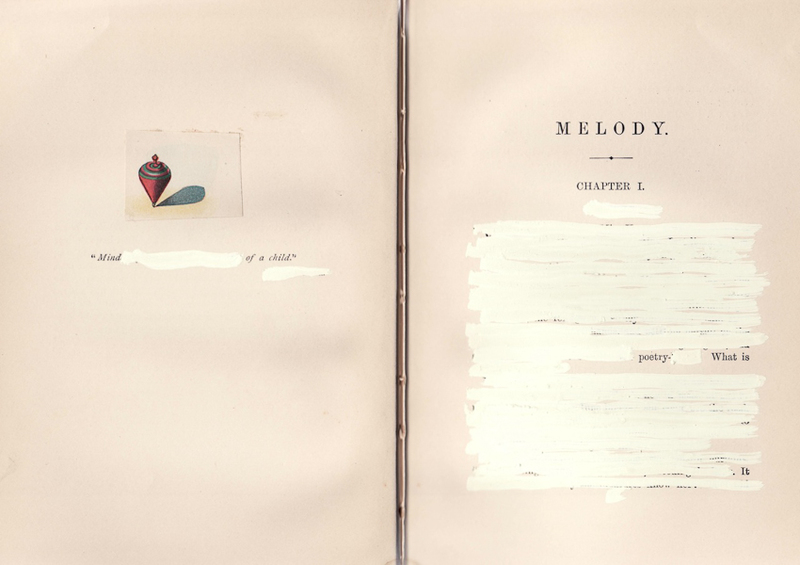 CLICK HERE to read Mary Ruefle’s erasure poem Melody full-screen and in its entirety. Would you like the Sunday Poem delivered to your email box each week? Subscribe to Gwarlingo by email. You can also connect on Twitter or Facebook. You can read Gwarlingo’s entire Sunday Poem series here. Melody: The Story of a Child © Mary Ruefle. 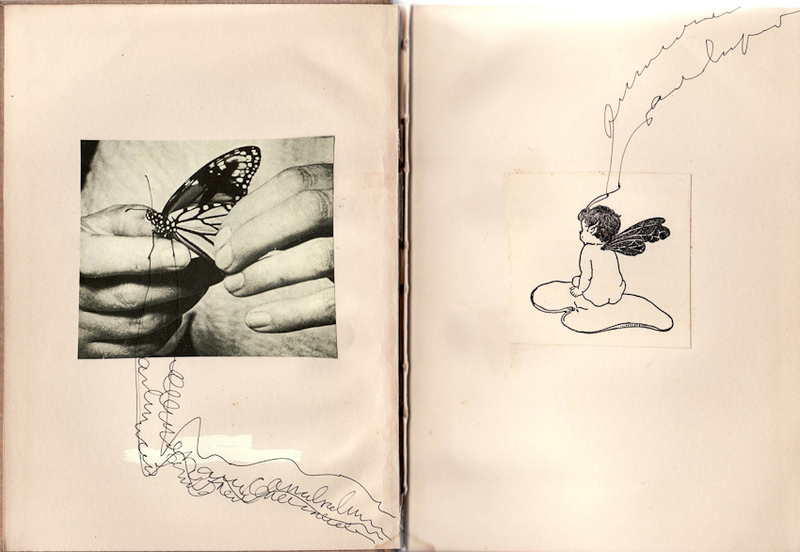 Images of Melody by Michelle Aldredge for Gwarlingo. Please feel free to share this erasure with others. We only ask that you provide the proper credit to Mary Ruefle and Gwarlingo. This is absolutely wonderful. A unique object that few will ever see – and apparently one that lives a risky existence – has found a way to be seen by many, thanks to Gwarlingo. And the thorough, intriguing, teasing context prepared me for full enjoyment of the work when you finally offered it to us. 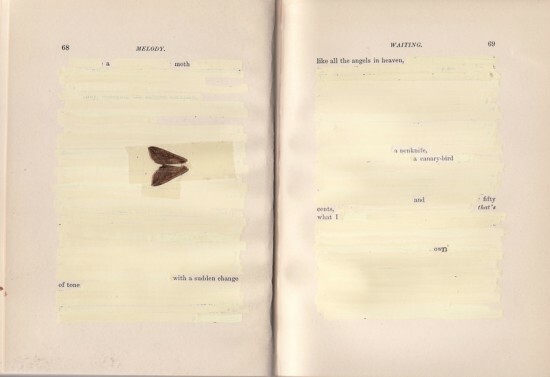 I had not fully appreciated the layered pleasures of erasure poetry, and now, with this gorgeous example from Mary Ruefle, I feel opened to something new. I love Mary’s work, and I have fond memories of her during my MacDowell stay. Thanks for posting this! Quite beautiful So inspiring. Thanks for this. So glad you liked Mary’s book, Daniel. It’s quite spectacular, isn’t it? Thanks for stopping by Gwarlingo. Just ran across this post. Great work. 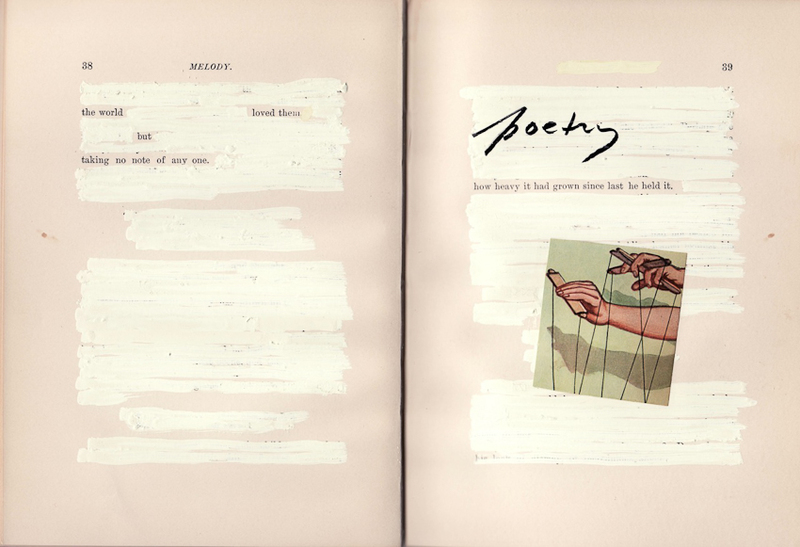 Another erasure artist is Joshua Poteat. 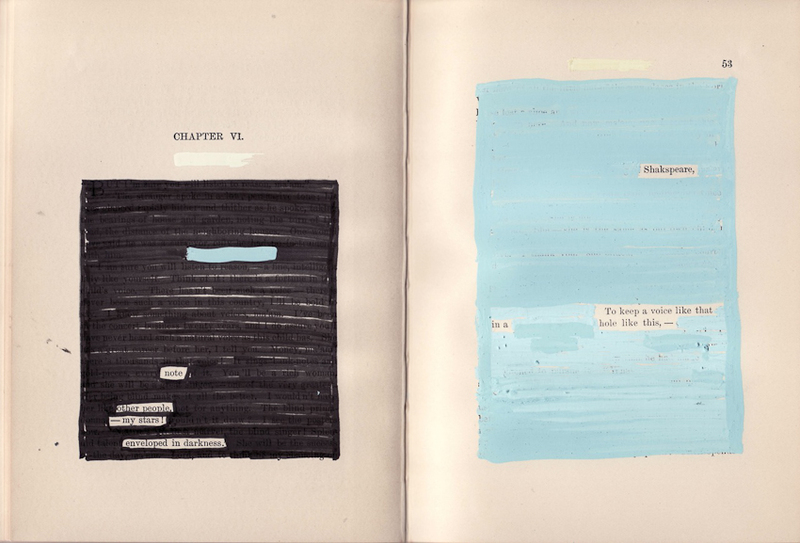 His book Illustrating The Machine That Makes The World has a truly lovely section of erasures…in this case, he erases his own work. Thanks for the tip on Joshua Poteat, Ashley. I’ll be sure to check him out!